The entire Northeastern United States has been affected by this massive storm. Our hearts go out to families who lost loved ones in the disaster. Slowly things are beginning to return to normal; power has returned in many locations, and some gasoline has been delivered to gas stations to satisfy long lines of customers. So how has this effected surgery recovery? due to Hurricane Sandy. The Packers and fantasy owners are entering heated playoff races, so surgery healing and Jenning’s rehab is topic for review. 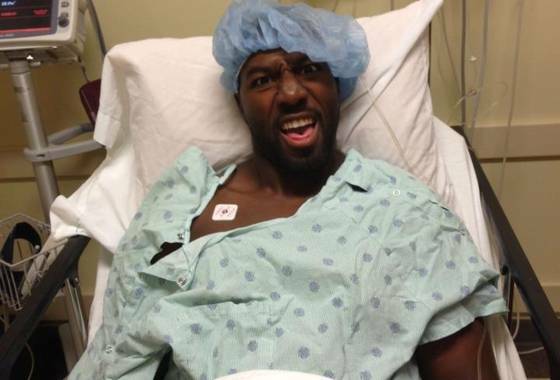 Jennings hopes to come back from his much needed surgery, to play again, before the season ends. Exact dates TBD. But how has extreme weather effected the less publicized? I know chemo patients who rushed to reschedule appointments to Monday, Pre-Sandy…and others frustrated by reschedule dates pushed further into November. “POST-Operation Lap Band Surgery Questions & Answers” found bloggers in relatively good spirits…focusing on good “mushie” nutrition; without power or the help of a fridge. Post surgery cleanliness, a challenge without running water in New Jersey. Emergency Responders, including our Doctors and Nurses press on seemingly at ease with the problems at hand. Maybe they are made of a tougher stock than the rest of us. Dr. Jordan Metzl, a physician at the Hospital for Special Surgery in New York, was hoping to run the New York City Marathon today, instead he and 500 fellow Runners in Support of Staten Island are on there way to deliver emergency supplies to Staten Island. Staten Island was one of the hardest hit areas during this week’s storm, accounting for about half of New York City’s 41 fatalities. At 8;30 this morning, these athletes boarded the Staten Island Ferry, carrying backpacks full of recovery aids: batteries, prepaid mobile phones, gift cards, baby wipes, personal hygiene items, medicine, garbage bags, hats and gloves, all for the hurricane victims of Staten Island. “We have our courses mapped out and we will use our legs to do charitable work,” Metzl said. “The running community is the most charitable community I know. I just think he might be right.